What is it about fruit salsas that make everything taste like summer? Maybe it’s just me! Here in NM, which feels like summer 340 days out of the year, I get to try lots of different salsas ranging from super spicy to mild but amazingly tasty. 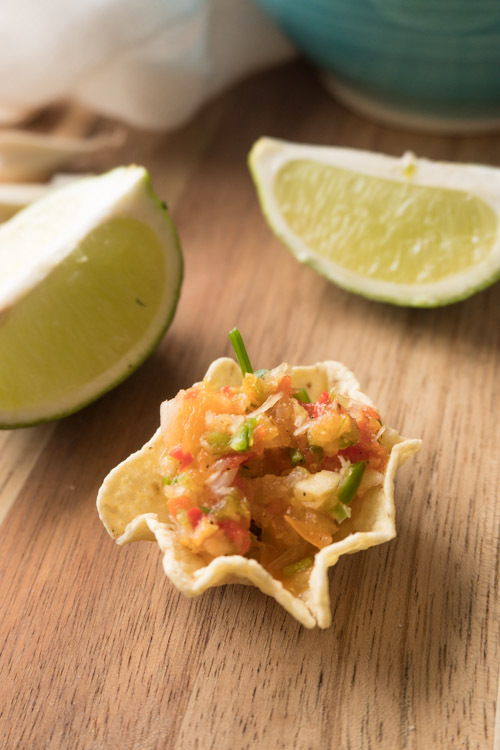 I have to say pineapple salsa is one of my favorites. 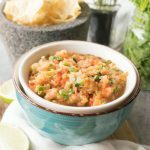 My husband and I love to chop up some leftover steak, fry up some corn tortillas and make tacos that are topped with this salsa. Seriously a delicious combo: steak and sweet pineapple salsa. Yes please, anytime! The pineapple is the perfect counter to the jalapeno, which even with the seeds removed, still packs some heat. Oh and don’t rub your eye after handling the jalapeno! I am speaking from experience here! I love that this recipe is so easy. Besides removing the stem and seeds from the jalapeno and cutting an onion in half, the hardest part is zesting and juicing the limes and well, that’s not hard at all! All you do is throw all the ingredients into a food processor or blender and chop up to your desired consistency. Sometimes I blend everything until its tiny and sometimes I like to blend only a little so all the fruit and veggies stay chunky. Like a pico de gallo. Either way, it always tastes good! 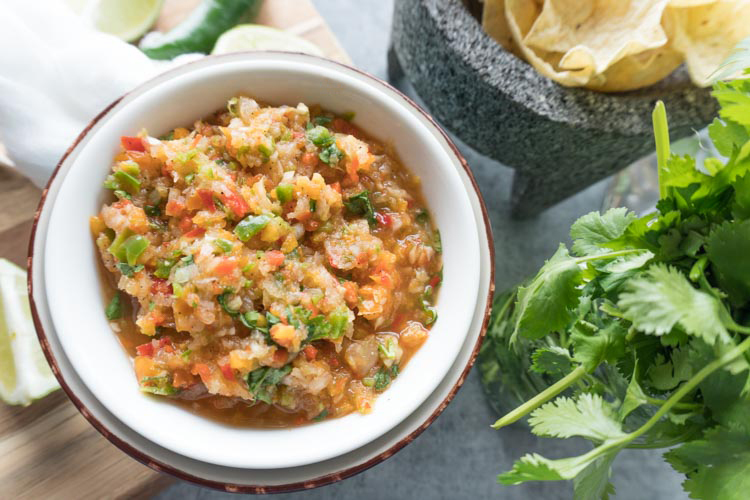 What is your favorite salsa combo? Do you usually stick with chips or do you put it on almost anything like me? Let me know in the comments below! Please visit my blog, https://www.ATableFullofJoy.com for more yummy recipes! Seriously one of the best pineapple salsas ever! You won’t believe how easy it is to make and how delicious it is! Serve on tacos or eat with chips! 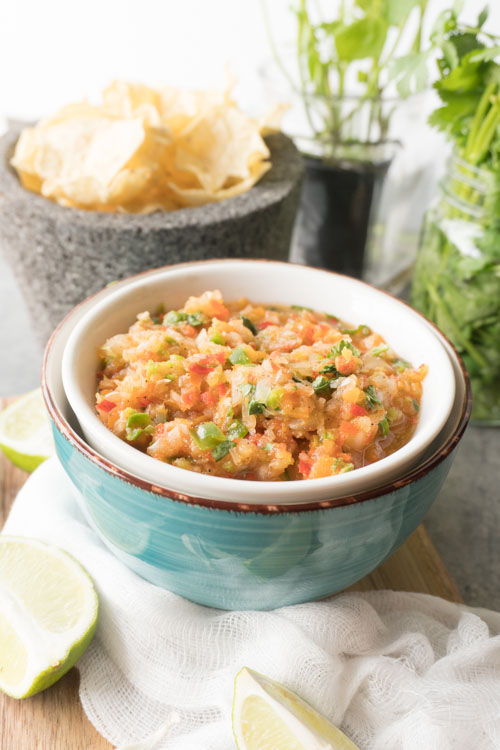 In a food processor blend the pineapple, jalapeno (without the seeds), bell pepper, onion, cilantro, and all the seasonings. Zest and then juice both limes into the salsa and stir it up. This gets better as it refrigerates. So if you make it the day before it will have time for all the spices to combine. However, eaten right away is still delicious! Thank you! Please let us know what you think after making it!